13:51. That's minutes and I'm talking about the opening track from Her Halo namely, 'An Ordinary Dream'. After a few odd years of obscurity and underground status in Oz, Music Theories/Mascot Label group have gone and signed these melodic masters of prog-rock and metal. 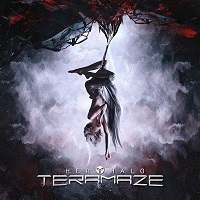 Teramaze plays hi-tech melodic stuff that goes back and forth on the boundaries of Prog Metal and sophisticated, cinematic metal, inspired by film and video games scores? Well. That's my definition anyhow and not entirely sure if the band would agree? It's however ultra melodic as well complicated stuff with several different layers of metal, emo, and prog and it all comes down to keeping busy while sounding posh. I would put them in the same kind of category as the Swedes of Seventh Wonder and vocalist Nathan Peachey is working in a similar field and mood as their former singer Tommy Karevik (Kamelot). Probably tailor made for Japan and their culture since it's simply oozing of 'name-your-fave-japan-video-game-here'. Guitarist Dean Well's axe cuts through the tracks like butter and it's just the ultra smooth performances and crystal clear tone and amp sound. Everyone knows 'Images and Words', Dream Theater's finest moment as well as the starting point for this kind of prog waxing. Her Halo is simply just more of everything. More emotions, more crooning, more... but not quite as superb anyhow. Nonetheless. It's a smashing album and highly recommended stuff. Big in Japan? Should be big all over the place in my humble opinion. Joe BONAMASSA: "Live at Radio City Music Hall"
UGLY KID JOE: "Uglier Than They Used Ta Be"
JOEL HOEKSTRA'S 13: "Dying To Live"
JOE LOUIS WALKER: "Everybody Wants A Piece"
CIRCLE II CIRCLE: "Reign Of Darkness"